www.derbyphotos.co.uk - The blog by Andy Savage: How to download Youtube 1080p HD videos as mp4 file for use with Sumvision Cyclone Micro 2+ Media Player. Welcome to my blog, Whats this about then? This is a place where I will be posting all sorts of things not just things relating to Derby and Derbyshire. On here you will find details of any videos I’ve made of things in Derby and also Time-lapse, stop motion animation, Tutorials etc. If I find some useful software for PC or iPhone then I will feature it here.I’m sure that there will be something of interest to someone on my many posts.Please leave comments on any posts if you like them. Don’t forget if you are new to my blog and would like to read through the previous posts then see the Blog Archive section on the left side of this page. Also there is a Search box at the top left of the page if you are looking for something but cant remember where it was. I am a trustee member of "Friends of Friar Gate bridge", aiming to get this bridge restored. How to download Youtube 1080p HD videos as mp4 file for use with Sumvision Cyclone Micro 2+ Media Player. I recently bought a new Media Player that copes with mp4 files at 1080p and for a couple of years I have been using a great free plug-in on Firefox that allows you to download videos directly from YouTube and thought I would share details on how to do it. The media player is a Cyclone Micro 2+ Full HD HDMI 1080p MultiMedia Player Adaptor and it pretty much plays any video files you try with it. These things really are very cheap but amazing. You simply copy the video files you want to watch onto a USB memory stick and the media player plays them via the HDMI connection on your TV. In my example below I am downloading a music video from YouTube which is 6min 19sec long, the .mp4 video file it downloads is 223Mb. The Add-on for the Mozila Firefox web browser is free and extreamly simple to use, I will show you how here. 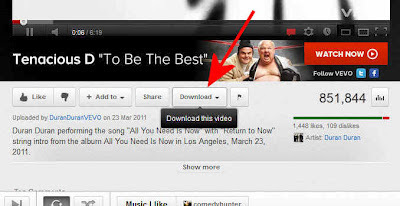 How to install the free Add-on to download YouTube videos. These screenshots are from my PC running Windows 7 64bit and Firefox v11.0. 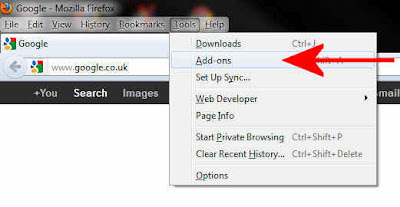 1) In Firefox goto the Tools dropdown menu and select Add-ons. 2) In the search box of the Add-ons window type in Download Youtube Videos as MP4 and search. 3) This should show a list of Add-ons, The BEST one is this one. Click Install, only takes a few seconds. 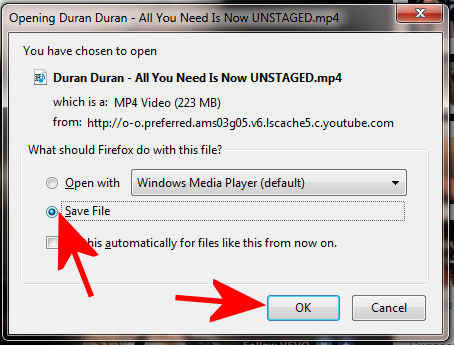 Once installed, close Firefox and rerun Firefox and goto YouTube and find a HD video. 4) Notice that now we have a new button called Download. Click it to see what quality you can download. 5) On this video it is available at 1080p as an MP4 video, Click MP4. 6) Ensure that the "Save File" option is selected so it saves it instead of playing it and click OK.
7) Wait for the file to complete downloading and you should now have a .mp4 file of your video on your hard disk. Now you have your .mp4 video file simply copy this file onto a USB Stick and insert it into the front of your Cyclone Micro 2+ Media Player and give it a go. Plays in glorious 1080p HD via HDMI. Note : If you don't know where your file has been saved then in Firefox goto the Tools dropdown menu and select Options, Click on the General Tab. In the Downloads section there is a bit thats says "Save files to..". On my PC I like to use C:\My Downloads but yours may be the default if you have never changed it. I hope someone finds this information of use. Friends of Friar Gate Bridge. My World Wide Panorama Entries. My favorite Ciders and Perries discovered. Hi, I am the webmaster of www.derbyphotos.co.uk Local photographer and film maker promoting Derby and Derbyshire. Hope you enjoy my blog bringing you the latest stuff for this area. How to swap Left and Right audio channels on your PC if they are swapped with each other. My simple solution to this problem. How to get FREE Wi-Fi at JD Wetherspoon pubs, very simple. The Incredible Jonathan Goodwin hanging off a cable car at Heights of Abraham, Matlock Bath. The famous Derby man that walks backwards writing down car number plates. Where have YOU seen him? Shardlow Car Boot Sale this bank holiday, Monday 6th May 2013. How to change a blown H7 Headlight bulb on a VW Golf mk4, Detailed with photographs. 90's Derby was the clubbing capital of the UK as you can see in this new documentary DVD. The filming location used for Thames House in the BBC TV series Spooks. Shardlow and Risley Car Boot Sale driving videos, enjoy realtime drives through Derbyshire with me.